In the US as many places there was a lack of snow in the 2011-12 season. Not in Hayward! One of the few spots to get snow this year was the Birkie Trail. Although many hours were spent shoveling & hauling snow to ensure a World Class event. 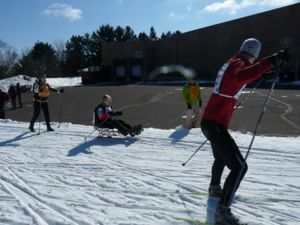 The Birkebeiner and Kortelopet (1/2 Race)reached their participant capacity of over 9000 skiers this year in November. s a lite snow falling for approx. the first 16km. Followed with Clear Blue skies and temps around -5c.As a whole the event ran very smoothly with wonderful weather for both skiers & spectators. This year the Am. Birkie expanded their Race Event booklet. This booklet has all of the information regarding the event- Start Times, Parking, Food etc. Many WL skiers and domestic skiers commented on how this was extremely helpful. Once again the ABSF ran a World Class Event!